Yeah, so breaking news last week—did you know cyclists were doping in the 1998 Tour de France? I know, right? Didn’t see that one coming, despite the fact that during that year a Team Festina car got caught at the French Boarder with 250 vials of EPO, six teams dropped out, everyone on the podium had already admitted to doping anyway, and the Festina Affair is like, the model against which every successive doping scandal is assessed, but beyond that—COMPLETE SURPRISE. But hey, French Senate, you do what you gotta do. As Anglophone, I’m dangerously low on Jacky Durand news, so I’m psyched to read his no-BS mea culpa. Stuart O’Grady, I wish I could believe more, but with so many of his Gan teammates still relying on clean-ish images (and who are missing samples from ‘98), the I-only-doped-once-did-it-alone thing is too pert and convenient, 15 years after the fact. And Zabel—well, consensus seems to be that you were always an [expletive]. Oh, and Kevin Livingston. Don’t even know what to make of that guy. Part of me despises him for not talking more other parts of me kinda respect the fact that he hasn’t taken to the opinion pages of the Wall Street Journal or New York Times, with no ulterior motive whatsoever I’m sure, to tell us all he doped. Anyway, in the fallout from this, Cyclingnews has, for some reason or other, decided to ask Lance Armstrong for comment which is just like—I mean, c’mon it’s [expletive] Lance. Obviously the—how old is he now?—obviously the guy doing his hardest to “win” being the most disgraced drug cheat in history. A sample quote: “Bikes, beer, and 18 holes of golf every afternoon. I wasn't exactly curled up in the foetal position…thousands of supportive people…I’m the whipping boy”. But whatever—Lance is Lance, like it or not, and he’s still been the dominant figure in the sport for the past two decades. Although, if you’d come out of a 16-year-coma earlier this year, you’d be hard-pressed to know that. For some reason, NBC Cycling’s Tour coverage was utterly and completely devoid of Lance Armstrong footage—a laughably stark turnaround from a year ago, when their commentator Phil Liggett couldn’t stop talking about how innocent Armstrong was. never mentioning anything he did—and by extension, nearly ever Tour de France for the past 14 years—somehow justifiable. Cycling, you may have heard, has a problem with “omertas”—the aforementioned Kevin Livingston might be presented as a good example. This propensity toward the powerfully undiscussable in and of itself is reason not to put anything on a Do Not Mention list, in the same way that one might hesitate to prescribe oxycodone to a recovering heroin addict. But more specifically, not mentioning Lance prevents anyone from the sullen discomfort of reflecting on what actually happened during the Lance Era. On the Champs Elysees last weekend, we had Miguel Indurain, Eddy Merckx, and Greg Lemond being awarded ceremonial yellow jerseys…for some reason or other. Notably absent was Lance Armstrong, of course—or anyone else from his years in the sport. Nice, and tidy, really—let’s just forget that any of it has ever happened. Of course, this is Miguel Indurain who, based on his his contemporaries and coaches, was almost certainly as doped as Armstrong, Eddy Merckx, who at the very least tested positive during the ‘69 Giro, and Greg Lemond, who…well, insert your rumor here. But hey—we solved the problem of the “dirty years” by agreeing to pretending they never happened. Take this interview Velonews did with USAC figurehead Steve Johnson, who said quote “It’s the entire cycling industry…who got pulled along by that vortex of the Lance Armstrong story. And nobody has to apologize for that. It just happened.” Which, frankly, is about as horrific a denial of responsibility as anyone could possibly offer. “Well, we were all part of the mob, so let’s just agree it’s no one’s fault”. Aside from being morally reprehensible—as if anyone cares about that—it’s also factually inaccurate. I mean, the entire Lance Armstrong Saga is rife with skeptics, detractors and doubting Thomases nearly all of whom suffered unduly, and who all deserve an apology from USAC, if for no other reason than Armstrong hasn’t offered one. Then there are a bevy of self-motivated researchers and writers—“wankers”, I suppose Brad Wiggins might term them—who did the footwork on numbers of drug tests, the UCI’s unwillingness to enforce its own rules, pulling back the curtains on the the 1999 samples, among a host of other details that lead to Armstrong’s downfall. This is a matter of record—the Times, as they say, was on it—and since USAC effectively turned a blind eye to all these people before Armstrong was persona non grata, I think this another group to whom Steve Johnson owes an apology. But most concerningly of all, is this rank unwillingness on Johnson’s part—and indeed, among most of those involved in the public face of the sport during the period of Armstrong Hagiography—to recognize that there are other people involved in cycling now who both didn’t reap direct Lance benefits, and who weren’t in a position to challenge the general Let-it-Ride attitude. Johnson’s interviewer Matthew Beaudin, for example, wasn’t hired by Velonews until well after the federal investigation against Armstrong—the information that later became the USADA case—was collected. Let’s go back to that NBC commentary team and their unwillingness to mention Lance. Among that group, you’ve got Phil, as I said one of Lance’s staunchest and most self-deluded supporters, Paul, his commentary partner who worked with Armstrong on the Motorola squad, and Bob Roll, who famously accompanied Armstrong on his comeback training camp and has some pretty [expletive] crazy ideas about doping and the French generally. Now, I’m sure there was some sort of pre-show instruction not to mention Lance—who wants to be reminded that maybe what they’re watching isn’t pure, or true, or believable, or whatever corny aphorism you want to use to ascribe to shirking intellectual burden of uncertainty. But as in the case of the USAC, it also lets a group of people who are very much culpable in Armstrong’s subterfuge stand before the world without offering a proper, long-delayed apology. I’m not saying we need to put them in the stocks and pelt them with expired FRS samples. A simple statement during the opening or closing features for the Tour would have sufficed. Something along the lines of “hey—we’re sorry about what Lance did. We’re sorry we helped propagate the myth, and we’re sorry that we didn’t apply a more critical eye to his performances, even after legitimate, meaningful doubts were raised. We failed you as an audience, and we’ll try to do better in the future”. As a fan, it’s something I’d sure like to hear, and frankly, it’s just not that hard to do. Why, just last week, I got unnecessarily mad at Team Belkin on the internet, realized my error, and apologized. It’s good to acknowledge when you’re wrong about something, becuase it shows people you care about being right, and that you honestly would like to avoid making similar mistakes down the line. And really, for all the drugs and doping and everything that’s come to light since, the Lance Tours did occasionally provide some pretty good racing—especially in 2003. To have essentially none of it mentioned by the exclusive US rights holder to save face or present a “safer” package—except obviously and awkwardly during one paid placement feature for Orbea, is a disservice to fans—past is prologue, especially at the Tour. That’s kind of what I was getting at with the “banned word list” in the Tour How The Race Was Wons—ignoring the past will only bring up uncomfortable questions that make eventually revealing the facts of record more awkward. Finally, addressing the cheating and ambiguity of the EPO Era like mature adults opens the door for real, cutting-edge analysis—things like what Science of Sport blog and various archivists are doing comparing VAMs and historical times. The idea isn’t, as Antoine Vayer or Frankie Andreu seem to think, to “prove” doping, but to draw parallels, to see how performance is evolving, and to keep the lines of conversation open lest we be once again limited to codewords like extra-terrestrial and not normal. Not to mention the fact that all this data is also pretty cool. If you’re listening to me now, you probably agree that the niftiest aspects of road cycling come from sussing out exactly how the the race was won. If one rider’s superpower is a steady 20 minute effort, while another thrives on tempo changes, that’s a pretty cool thing to know as they slug it out on the side of a mountain. And in the end, this decision ignore rather than address The Lance Problem is just another example of what I mentioned after last years Tour—the best analysis and the most compelling coverage in the sport of cycling comes from fans, not broadcasters. With alleged professionals like Wilcockson and Liggett and Abt still unapologetically mired in “complex characters”, “jealousy”, and “rip Lance time”, and their more serious colleagues often reporting on stories that come out of social media, it’s not something I see getting better anytime soon. no, to expose the rank artificiality of the firewall between production and talent. It’s recorded on the 2nd floor of a sloppily-renovated apartment in Hartford CT, to drive home the point that tremendous up-front costs are no harbinger of a quality product. I blog and put all of my cool cycling stuff on the web at Cyclocosm.com, I tweet about cycling using the handle @Cyclocosm, there’s a Tumblr at cyclocosm.tumblr.com, and if you search for Cyclocosm on facebook, Google Plus you will probably eventually run across my page. Yes, it’s another delayed Cyclocosm Rantcast—but I’m not sorry, because last weekend I was temporarily relocated to the redwoods and hoppy, delicious ales of Sonoma County to ride bikes with fun and interesting people, and watch a little event you might have heard of called the Tour of California. It seems an odd juxtaposition, really, because the topic of this rant is Beinsport’s coverage of the Giro d’Italia. Or rather, it was supposed to be. But I can’t in good conscience complain about something more or less sight-unseen. While I did manage—at long last—to catch a bit of actual BeIn TV coverage, it was during stage 14’s fog obscured nightmare. But I’ve heard, actually, and from several sources, that BeIn’s broadcast commentary is quite good. Certainly, if the effort Carlton Kirby made to pump excitement into 40 minutes of staring at an empty road lined by bored, cold Italians is any indication, it couldn’t be that bad. But as the old saying goes, if Dan Lloyd delivers understated quips in his butter-toned British accent and no one’s around to hear them, does it count as good coverage? So today’s rant will be less about coverage in its proper sense, and more about the contracting decisions that get made delivering the content to the people. Let’s start with something everyone can see—at least, in the US. Maybe the mish-mash of rights and geo-restrictions will be prevent a worldwide audience from seeing these, but head on over to beinsport.tv and see what you can see. I’ll be fair here—credit is definitely due for giving cycling and the Giro much more exposure around the site than it used to have. A few months ago, the only cycling story on up was about [Lance] Armstrong getting blocked from racing a tri—now they’ve got an article and a video highlight for every each stage—if you look under the “video” header, that is—and clips even make their way onto the front page occasionally. That said, it’d sure be nice if cycling could have a link under “other sports” or if doing doing a search for cycling brought up more than just 11 articles in some random order. And let’s take a closer look at these race reports—here’s Stage 17, which is currently two sentences long. And the video seems to suffer from the Phil Liggett effect—not that Dan Lloyd does a bad job with it, more that he seems to just kinda be talking over some footage they threw at him. So let’s check out Stage 16…hmm “Intxausti timed a late sprint and fought off the challenges…in a dramatic late finish” good so far…”Intxausti was part of a 22-man breakaway group in the early stages” (huh?) “later managed to gain a five-second advantage” None of that is right. “Nibali…setting a fierce pace at the front of the peloton as he attempted to bridge” No, that’s not really… “ it was not until they entered the final 25 kilometres that the 22 separated.” But you just said that breakaway happened in the early stages? Or did you mean separated from each other? Well, maybe the video will make more sense…nope. Actually, it, uh looks like this one’s just a music video. With some bikes rolling along. And no one talking about the race. Oh, and some guy wins. Nice. Very explanatory. Thanks for that recap. Similar nonsense, weird wording— my favorite was “Uran edged Carlos Betancur by 20 seconds” in Stage 10— and straight-up factual errors pepper most of the BeIn recaps. It’s tempting to blame the network for this mess, but you know, in the grand scheme of things, BeIN is really only a mouldering rusty pipe through which feces flows. You see, nearly all these reports and videos are actually produced by a company called “Omnisport”, which is itself a sub-entity of a company called the Perform Group. And as you can read on Omnisport’s riveting product offerings page, this is kind of what they do, producing “page ready content”—a Orwellian turn of diction if I’ve ever heard one—so that doofers like BeIn, and I’m guessing similarly clueless broadcasters from other geographic regions who need to farm out their work—have something to put on their websites so that underlings can report to middle managers who can report to executives that they’re doing really cool things with the web, probably backing it up with some large-sounding numbers that no one understands. Welcome to the world of Rights Organizations—entities like Perform Group that you’ve never heard of but who seem to lurk everywhere. Last week, I was introduced to a particularly malevolent little troll called Base79. Name mean anything to you? Oh, they’re only YouTube’s largest content partner in Europe, with 550 million views per month on content they “produce”—though I use that term in the loosest possible sense; afterall, they don’t make any content of their own as far as I can tell. All they really do is offering things like distribution—that’d be uploading to YouTube—revenue generation—setting up ads to run on YouTube—and rights protection—the operation of YouTube’s automatic content detection software by which I—and the hapless innocents at Orica GreenEdge—discovered them. Far be it for me to assail sock-puppeting well-worn YouTube features as some sort of business model—if you can find someone with money and trick them into throwing some in your direction, more power to you. My objection comes with the fact that as a “partner partner”—yes, that’s a literal quote—of the Giro, they’re responsible for the irredeemable mess that is the Giro’s YouTube page. One language, no English subtitles, irritating references to off-site links with no explanation of why these couldn’t be uploaded to YouTube as well, and oh yeah—video quality on par with dropping acid through a bad pair of cataracts. ery long time ago, when, I dunno, the Earth was pure and fairy kingdoms dotted the land, the purpose of copyright was to protect the work of creative people, giving them a chance to recoup investment, make a living, and generally just incentivizing the creation of newer, cooler, more creative things in the future. But currently, as these rights organizations show, copyright kinda does the exact opposite—pushing firms to dry-hump products for all they’re worth while adding nothing of value to consumers, and arguably—depending on if you’re a shareholder or not—nothing to society as a whole. But really, the problem of copyright is out-of-scope for this rant, so I’m gonna pull it back to cycling, and the Giro specifically—Michele Acquarone wants to grow the Giro, or at least says he does. As a watcher of the sport—and by watcher I mean person who reads things on the internet because there is nothing to watch—I’ve no shortage of 2nd- and 3rd-hand reports telling me he’s done just that. But here, with my own eyes, in the US? I can’t see anything that’d suggest a single marketing dollar had been thrown the Giro’s way. And honesty, eh, it’s his, or his organization’s own damn fault. They sold out rights to a channel no one can see, who further outsources to obviously incompetent contractors for their almost-invisible online content. And with another ill-advised partnership, RCS has managed to kneecap the YouTube audience—I’m sorry, the two-billion-eyeball YouTube audience—not just in the sense that the Giro’s “official” YouTube offerings are crap, but in that the efforts of people like me who do a halfway-decent job or presenting the event FOR FREE are actively being undermined. This, THIS is how you grow your event, Mr Acquarone? I can only hope that someday I get the chance to ask you how, exactly, you thought was going to happen. The Cyclocosm Rantcast is written produced and everythinged by Cosmo Catalano—that’d be me—one of the most dominant pack fodder finishers in the history of Cat 3 racing. I currently reside in Hartford, Connecticut. My blog is Cyclocosm.com, I tweet using the handle @Cyclocosm, I make a video podcast series called How The Race Was Won, you can see them all at vimeo.com/cyclocosm because YouTube is for copyright trolls. If you’re relatively new to my work, check out Cyclocosm.com/charts for some cool stuff you may not have seen. And now, I’m going to bed. Yes, the Rancast is back this week, with more-or-less proper intro music—more on that later. But I’m going to surprise most you today by NOT ranting about BeINSport’s Giro coverage—or at least few miserable dribbles of it (dribbels of the not-on-nosebleed-cable or dish package variety) that my eyeballs—and most other eyeballs across this great nation—have access to. No I’m saving that for next week, and giving BeIN seven more days to get their act together. AS my fellow Dartmouth alumnus Steven Colbert would say, BeIn Sport, you’re on notice. Today, I’m actually going to focus on a topic that is actually of more global concern to cycling—mondialization. (see what I did there). Yes, the barbarized phrase of Pat McQuaid, the rented horse of the UCI, their all-too-ready and all-too-unconvincing riposte any time someone brings up doping or corruption or some combination of the two—mondialization—the expansion of this decidedly European sport beyond Europe. And it’s a great idea—just not, as you probably have come to expect by now—the way the UCI is carrying it out. First, let’s start with the word itself: when spelled with an “O”, it’s technically not even an English word. It should be Mundialization, with a “u”, but you know, what, that’s fine. If you’re an anglophone and you’re not OK with loan words and your keyboard doesn’t contain the characters ð, ƿ, and þ, you are a hypocrite. No, my linguistic beef stems from the fact that the word “globalization” isn’t used. Now I know that for some of you, this term conjures up big ugly corporations, rich heartless dudes in suits, and This American Life listeners flagellating themselves to Mike Daisey in an attempt to atone for loving their affordable, stylish, inhumanely-produced iPad. But it should also conjure up images of a modern, largely self-organizing practice that—for example—let Japanese parts manufacturers prove to a product-starved world market in the 1970s that their cycling bits were as good or better than any established European brand, and that let a certain American company demonstrate the awesomeness of both TIG-welding and mountain bikes at scale, almost overnight around a decade later. But “mondialization”—to me, this does not inspire visions of the same interconnected processes. I realize this may be my non-European, anglophone bias once again, ascribing some level of haughtiness to any phrase rooted deeply in French, but I can’t hear “mondialization” without thinking of Mustapha Mond, the benevolent totalitarian overlord in Brave World. Or le beuax monde, the most pretentious way to refer to fashionable society. Or various mustachioed landed aristocrats piloting Jules Verne-era contraptions around the globe, saving native populations from themselves because it is obviously, we know better than they do. And I get that the UCI is, like a not-insignifcant minority of the rest of the world, French-speaking and that these associations may not be entirely intentional (though I can’t help but feel that if anyone from the UCI listens to this, he or she—who am I kidding…he—might be sitting there, scratching their head like “why is zees a bad zing?”) but just because it’s an honest linguistic coincidence doesn't mean it’s not a branding problem. But far more deleterious than any quibble over wording is the disingenuous, self-serving way in which the UCI has carried out this “mondialization”. Regardless, and I think in spite of the UCIs efforts, the sport has been getting more and more international all by its little old lonesome by going on 20 years now. I mean I’m not even talking about the US, where the Coors classic was bringing deep international fields to the Rockies long before the UCI brought the rainbow jersey to colorado springs, and the Tour de Trump hung on on the East Coast for most of the 90s. No, I’m talking about events like the Tour de Langkawi, which dates back to 1996, and came about largely because the Malaysian prime minister thought would be a cool idea. Or the Tour Down Under, which, while the UCI may have played a role in ensuring its prominence, wasn’t the product of some special world-sport objective. In wonderfully insightful move, the ASO has been putting Tour of Qatar—host of the 2022 World Cup—for over a decade, while the Japan Cup dates all the way back to 1992 with occasional interruption. Then there’s the Tour d’Azerbaijan, which you’ve probably seen ads for on Eurosport. It wrapped up earlier this week, and while it still doesn’t quite attract the top names, the field still contains a number of ProTour squads, and the race has been relentless in its self promotion. Bloggers were offered 100-200 Euro to write stories on it—and, while that’s not how we roll here at Cyclocosm, a seedy internet protip is that they were probably ready to offer more. Anyway, the point is that all of these events, while they may have benefitted in some way from the UCI’s presence, is that they weren’t part of a sweeping scheme of “mondialization”—someone, somewhere wanted a bike race, and organized the money and production crews and promotion and offered to pay bloggers all to make it happen. Kind of like how Mike Sinyard did with the Stumpjumper, which is why globalization is really the better term. What didn’t happen is that a fully owned subsidiary of the UCI didn’t look for the biggest market it could find, roll out a red carpet for the locals, and attempt to put on an event which it could own, and more importantly, sell, as the UCI did with the Tour of Beijing. I mean, in and of itself, that’s not a bad thing—who am I to accuse the UCI of wanting to make money?—it’s gussying it up as some sort of grand benevolent objective—this “mondialization”—when its an obvious play for increased income, that’s distasteful. And that the UCI’s race organizing arm is working perhaps a bit harder than it should to find new races to make money off—oh, right, and that Tour of Beijing “helps Beijing position itself as a city that cannot be overlooked when it comes to…” wait for it “…protection of the environment and promotion of a healthy lifestyle,” when nothing could be further from the truth. So right—internationalizing cycling, more people racing bikes in more places—is awesome. But for the UCI to act like its just recently begun instigating something that’s been going on of it’s own volition for three decades is totally idiotic, an idiocy made all the worse by the organizations pretentious notion that this might somehow offset any damage caused by its inability to properly address, oh I dunno, doping. As Pat McQuaid found when he “mondialized” cyclocross over to Lousiville, no matter where the UCI takes the sport, its reputation will always precede it. Hey, the fresh beats are back—I’ve appropriated two of my favorite themes, see if you can guess them, but more importnatly this means we now have a proper outro. My name is Cosmo Catalano, an oxygen-carbon exchange unit currently located in the City of Hartford Connecticut. You’re listening to a Rantcast, one of about a zillion projects I do on my cycling blog, cyclocosm.com that’s h-t-t-p colono-slash-slash c-y-c-l-o-c-o-s-m dot c-o-m. I also produce a race recap video podcast called How the Race Was Won, which you can google, and I’m on the Twitters, username at-Cyclocosm. If there’s a topic you’d like to hear me grumble about in a future rantcast, I’m taking requests for 20-second, mini-rants at cyclocosm.com/pfb, as part of a fundraiser for PeopleForBikes.org—all you have to do is contribute a $20 donation. But be quick about it, it’s only open for eight more days. Sure, the sport has TV rights, but they remain clenched firmly in the hands of race organizers. Sponsors don’t get to collect income from ticket sales —there are no tickets, or $13 beers, or stadium oriented development and real-estate projects to skim from. In fact, as a sponsor, fans expect you to invest in them, in the form of hilariously retrofitted vehicles packed with cheap trinkets and attractive young women to toss them out. And since teams radically change in terms of brand, roster, and appearance from season to season, there’s no—ok with the possible exception of Euskaltel, where fans actually own part of the team—there’s nt storied franchise entity to rally around. It’d like major league baseball, except every team is the Florida Marlins. Miami. Miami Marlins? Really? Cyclingnews helped conduct a study recently to assess the ROI on that one slim vector for those few companies who fund cycling. That’d be media exposure. As Cyclingnews is a media company funded by cycling, I’m not sure I put that much stock in their assessments—doubly not sure because they decided to make downloading their report a lead-gen opportunity download with misleading opt-out text—but, anyway, the numbers were roughly in line with what Jon Vaughters was boasting to Joe Lindsey about four years ago—90mm dollars. And that sounds like a pretty good deal, but then again, big numbers are really, really easy to come up with. For example, YouTube estimates people spent over 164,000 minutes watching How The Race Was Won videos in the month of April—that’s 104 days, 3 hours, and doesn’t include the 290,000 impressions served by Vimeo embeds in the same time period, but I digress—the point is sponsors and potential employers aren’t exactly kicking down my door. And this is because all exposure is not created equal. Example A: I was raised in a veritable sea of cigarette ads and to this day, I cannot shake my bizarre aversion to camels, cowboys and the phrase “alive with pleasure”. 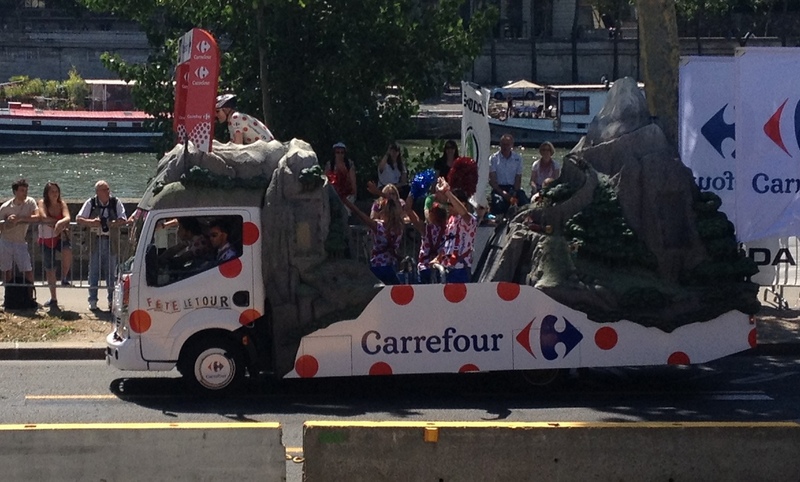 So sure, when Thibaut Pinot wins Stage 8 of last year’s Tour, that is indeed millions of dollars of exposure for the title sponsors. The French National Lottery and a French Building Supplies distributor get millions in their target audience, at prime-couch-wart time staring at their countryman in their national race. For CSC, I think the plan was that cycling stereotypically appeals to the sort of nerdy, well-off white dude that you’d—again, stereotypically—find making IT purchasing decisions. Plus, Team CSCs reputation, their brand, if you will, was that of an efficient, successful, modern team. Even after Riis, Hamilton, Jasche, Basso, probably Jalabert and etc., I think to this day, Team CSC’s image as the forward-thinking, commando-campers, attacking boldly in a sport of dull US Postal and backward also-rans, remains intact. Basically there are two ways to slice the sponsorship orange. The first is obvious—you’re the team that wins stuff. Right now, even after a roundly miserably classics seasons, that’s Sky. It’s big, superfunded, successful, on the cover of every newspaper the next morning, but also boring as hell and nobody really likes you. I shouldn’t say nobody really likes you, but c’mon—being a fan of Sky is like being a fan of the Yankees or the Dallas Cowboys, or Manchester United. Associating with the perennially dominant brand makes you a tourist, or a bandwagoner, or at best, that guy. The other way to show your sponsors return is to be the squad where people really like brand and want to associate with it—like I think CSC once was. And today, you still have a pretty well established Cult of Jens, of Johnny Hoogerland, and to a lesser extent, Thomas Voeckler—though, to be fair, he seems less interested in attacking and more interested in annoying the hell out of everyone. You might win rarely, or never at all, but you make the race exist, or at least interesting, and the viewers at home appreciate it. I think this was especially evident at Liege, where, around 15k from the end 260 kilometer event, you had the top, top riders at the head of the race, the pack reeling behind them, and everything was six pedal strokes, check over the shoulder, and coast. It’s not quite as bad as the NFL, where coaches literally play not for victory, but to avoid criticism for doing anything that might have caused a loss, but I feel like it’s getting there. Don’t get me wrong, there are other factors, too. Riders on the whole are better athletes than they used to be, and bigger rosters allow groups within teams to peak for different events, making for a fitter peloton, and one that’s less prone to lose control of an event. Plus the efficacy of the single leader strategy has taken plenty of strong riders who might otherwise animate and turned them into bottle carriers, gap closers, or wheelsuckers. So to continue to increase the value this second style of sponsorship, remain attractive to sponsors who are not especially interested in the European mass audience, and, frankly, to ensure the racing stays interesting—cycling really needs to better incentivize the sort of risk-taking that can turn a bike race on it’s head. It’s done quite the opposite in recent years; with the Tour scratching bonus seconds and bunching the points scored on a given stage into two overloaded sprints, the second of which occurs on the finish line and thus is already contested by everyone. The Giro’s Intergiro classification, which was literally a stage race to points that were not the finish line, was unfairly maligned as being too complicated and nixed after 2005. I know it’s almost trite to complain about the death of panache, people have been doing it since Anquetil, but surely we can do better at assessing and rewarding actual, purposeful aggressiveness than polling journalists and giving some guy a set of red numbers to ride in the next day. Break the stage into zones based on predicted race situation, and offer prize money for successful attacks in the dullest or most critical areas? Restore the Intergiro or the intermediate sprints competition? Actively penalize teams who don’t send riders up the road? I honestly don’t really know—but I think it’d be a welcome change to watch as the sport experimented trying to figure it out.